In small bowl, mix beans, cumin, coriander and red pepper. Stir in cheese. Divide mixture evenly among wonton wrappers (about 1 tablespoon per wrapper); spread mixture evenly over half of each wrapper. Fold wrapper in half over filling; do not seal. In 12-inch nonstick skillet, heat oil over medium-high heat. 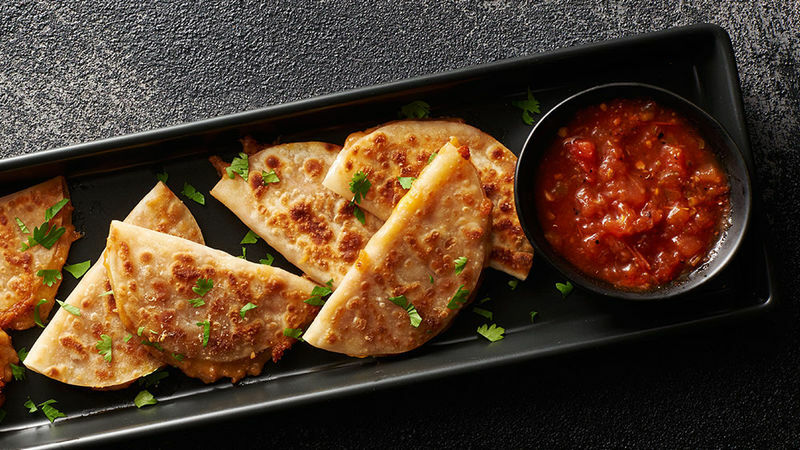 Add wonton quesadillas to pan; cook uncovered 1 to 2 minutes or until browned in spots. Turn and cook 1 to 2 minutes or until cheese melts and filling is hot. Transfer to serving platter; top with cilantro. Serve with salsa, green onions and sour cream for a little nacho flair. Bean and cheese filling can be made up to 4 hours ahead, then covered and refrigerated until ready to assemble quesadillas. Let filling stand at room temperature 30 minutes before assembling quesadillas.